Where do your style ideas come from? I was thinking about this question last week as I wandered through this year’s fashion exhibit, PUNK: Chaos to Couture, at the Metropolitan Museum of Art. Believe it or not, my inspiration comes as much from art exhibits as it does from the New York streets. But then, I'm a museum junky. I often see something--a painting's gorgeous color, the subject of a black and white photograph, or, perhaps, a cultural or historical detail in an ancient object--that thrills me. It's not that I'm dying to replicate the thing, but rather that I feel it could influence my style on some level. Not surprisingly, over the years, the Met's annual fashion exhibit has often sparked style ideas. Case in point: The plaid fashions in this year's Punk exhibit. It's the inspiration behind today's New Day/New Outfit (above). As I'm sure you know, this year's Met fashion exhibit looked at Punk's influence on high fashion. After college, I landed in NYC in the midst of Punk’s so-called 100 days. Though many of the exhibit's ensembles were infused with Punk elements—torn fabric, safety pins, graffiti and so on--I can't say I remember seeing anything quite like them at the Mudd Club, C.B.G.B. or other NYC clubs in the late 1970s. Still…I found myself admiring many of the collection's details, such as the paint-splattered evening gowns, the garments made of recycled materials, and the DIY embellishments. I hadn’t thought about it before, but the Punk era--the street fashions, not the couture re-imaginings--was all about DIY. I particularly enjoyed the "Clothes of Heroes" room with mannequins dressed in leather, torn chunky sweaters and plaid bottoms (skirts or slacks). Apparently, the British Punks had embraced their tartan roots. 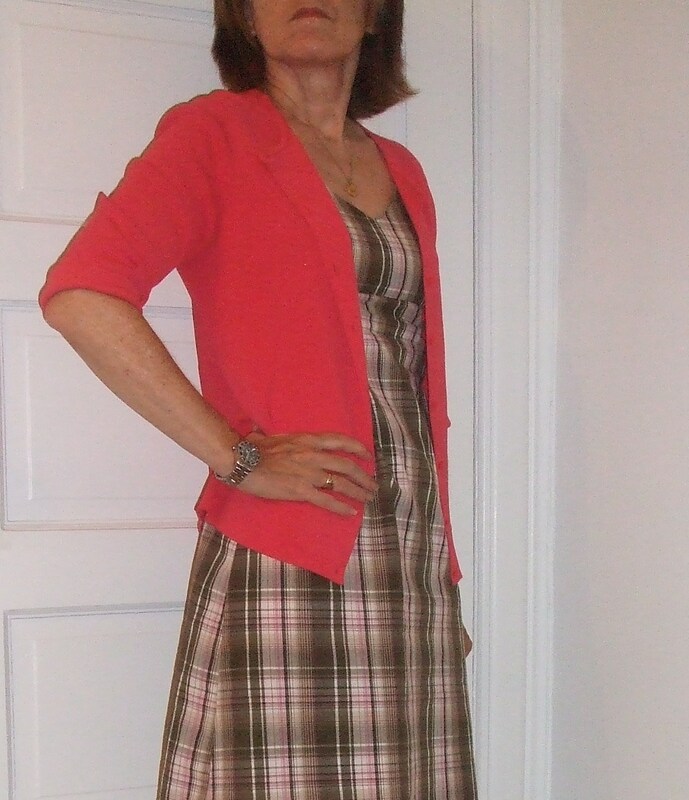 When I got home from the exhibit, I went to my attic wardrobe and found a plaid sundress. I’d totally forgotten about it! Now that I'm over 50, I'm attracted to skirts and dresses with prints. Prints are a wonderful way to hide the "lumps and bumps." And plaid is a refreshing change from floral, polka dots, graphic prints. I tried to create my own take on the "chunky torn-neck sweater" look with a sweater that has a loose neckline (above). I folded the sweater over a narrow belt (hidden) to make it look a bit "chunkier." (I have chunky sweaters, but they're too hot for summer!) Nothing about my "New Day/Outfit" says "Punk," of course. Style inspiration, in my mind, isn't about being a copycat. It's about being inspired to find your own look. Plaids are fun to style because you can do so much with color and texture. Here's my plaid sundress with a no-nonsense olive cable sweater and a barbecue-ready hot pink ¾ sweater. If you saw the Punk exhibit or checked out the galley photos, you know the plaids were all wintry wools. Designers have been adding more and more plaid garments to their collections over the last year or so. Last winter, I saw a woman over 60 in a leather jacket and kilt. I thought she looked smashing. I’ve been thinking I might invest in plaid skirt this fall. FIY...A quick online search took me to a well-priced plaid skirt at Land's End. The Women's Plaid Pleated Skirt (Below The Knee) - Classic Navy Large Plaid, 10 ($45) is available in 5 different patterns and Sizes 0-16. Meanwhile, according to the NY Times, the only shows to attract more visitors than the “Punk” in recent history are “Chanel” (463,600 visitors in 2005), “Jacqueline Kennedy: The White House Years” (559,902 visitors in 2001), “Superheroes: Fashion and Fantasy” (576,000 visitors in 2008), and, of course, the “Alexander McQueen: Savage Beauty” (661,509 in 2011). I was sad to see last year’s “Schiaparelli and Prada: Impossible Conversations,” (339,838 visitors) wasn’t on the list. It was one of my favorites. So...where do you get your style ideas? The street? Fashion magazines? Friends? Your mother? Traveling around? I'd love to know.